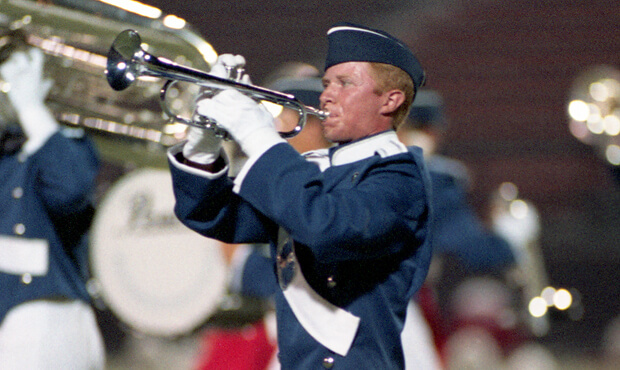 The summer of 1995 saw the Cavaliers win their second Drum Corps International World Championship title with "The Planets," after losing to Blue Devils all four times the corps met during the regular season. BD's 3rd place "Carpe Noctem" show was perhaps the eeriest production ever witnessed on the field, finishing under the World War II retrospective of the Cadets of Bergen County. Madison Scouts, with a show that later became known as "A Drum Corps Fan's Dream," generated some of the loudest screaming heard in Orchard Park's Rich Stadium. Phantom Regiment's most memorable moment was a "group portrait" and Santa Clara Vanguard's 6th place "Not the Nutcracker" was—in the opinion of many—pretty darn weird. Finishing in 8th place, Glassmen successfully placed higher than the year before for the 10th season in a row. Colts finished in 9th, with the corps' highest placement ever. Crossmen turned symphonic and the 12th place Magic of Orlando celebrated the animals of the sea, land and sky. A few tenths above was Carolina Crown, a new face in the Finals. The 50th anniversary of the end of World War II also provided the theme for Bluecoats' 7th place "Homefront: 1945," an oft euphoric and sometimes bittersweet look at the lives of those left behind during a conflict that touched every life in America. The brass and percussion wore military insignias on their sleeves and hats like those of servicemen's dress attire and the color guard members wore fluffy skirts, white blouses and hairstyles from the 1940s. After opening with a solemn soprano solo of the "America the Beautiful" theme, a peppy rendition of Johnny Mercer's "Come Rain or Come Shine" led into a percussion feature that saw members of the horn line get in one last dance with their girlfriends prior to "Shippin' Out," the title of the piece by corps brass and percussion arranger Bruce McConnell. The bugle call of "Reveille," after a horn block parade-in-review formation and drill sergeant's whistle, was joined by a number of other melodies associated with the era, including "Over There," a George M. Cohen piece sung by soldiers in both World Wars. Included in the medley was "Don't Sit Under the Apple Tree," a WWII tune popularized by Glenn Miller and later by the Andrews Sisters. The lyrics are about two lovers who promise to love only each other while one is away at war. The loneliness of having one's loved one on the other side of the world was expressed by "I'll Be Seeing You," the tender Sammy Fain melody that survived well past the 15 performances of the 1938 musical, "Right This Way." The color guard expressed the heartbreak of worrying about their lovers and then unfurled flags that appeared faintly as envelopes sent from the front. Bruce McConnell's "Newsreel" captured the essence of the theatrical clips that brought the sights and sounds of the war to the masses in the days before television became king. Millions of Americans flocked to the local movie theaters each week to witness the latest news from the European and Pacific conflicts in a way that carried more emotional impact than reading the stories in a newspaper. A drum effect mimicking Morse Code led into snippets of various armed forces melodies, building into an increasingly violent and combative musical stew. 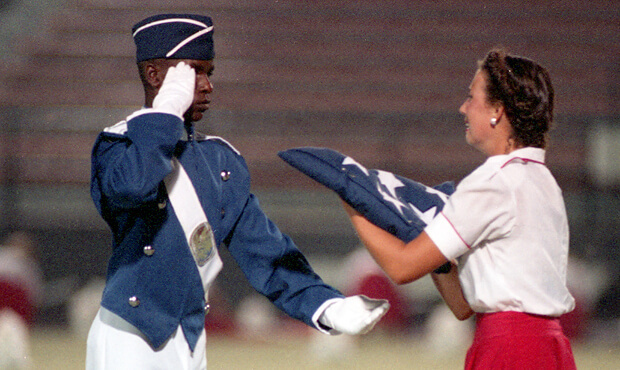 With tensions at the breaking point, the music ended with one of the guard members tearfully receiving a folded American flag from a military honor guard member, representing the terrible cost of war on a personal level. Discount DVD offer ends Monday, Nov. 12 at 8:30 a.m. ET.